Seisdedo, M., Herrera, R. H., Arencibia, G. & Sorinas, L. Tools for managing water quality from trophic state in the estuarine system Cienfuegos bay (Cuba). Pan-American Journal of Aquatic Sciences, 11(4): 264-275. Download PDF file (610 Kb). Martins, J. M. A., Silva, T. S. M., Fernandes, A. M., Massone, C. G. & Carreira, R. S. Characterization of particulate organic matter in a Guanabara Bay-coastal ocean transect using elemental, isotopic and molecular markers. Pan-American Journal of Aquatic Sciences, 11(4): 276-291. Download PDF file (1,928 Kb). Pinto, D. S. B., Maltez, L. C., Stringhetta, G. R., Pellegrin, L., Nitz, L. F., Figueiredo, M. R. C. & Garcia, L. O. Ammonia and nitrite acute toxicity in juvenile piavu�u Leporinus macrocephalus (Actinopterygii, Anostomidae). Pan-American Journal of Aquatic Sciences, 11(4): 292-300. Download PDF file (167 Kb). Christo, S. W., Ferreira, A. L. Jr., Cruz-Kaled, A. C. & Absher, T. M. Recruitment of oysters of Crassostrea genus (Bivalvia, Ostreidae) in Guaratuba Bay, PR, Brazil. Pan-American Journal of Aquatic Sciences, 11(4): 301-308. Download PDF file (1,864 Kb). Del Valle, J. C., Michielis, M. S., Radonic, M., L�pez, A. & L�pez, A. M. Digestive and metabolic profile at the biochemical level of juvenile flounder Paralichthys orbignyanus (Valenciennes, 1839) (Pleuronectiformes: Paralichthyidae). Pan-American Journal of Aquatic Sciences, 11(4): 309-323. Download PDF file (688 Kb). Cattani, A. P., Ribeiro, G. C., Marcon, E., Soeth, M., Hostim-Silva, M., Clezar, L. & Spach, H. L. Fish assemblage dynamics in the Ratones River Mangrove, State of Santa Catarina, Brazil. Pan-American Journal of Aquatic Sciences, 11(4): 324-335. Download PDF file (893 Kb). Pedro, N. H. O., Pellegrini, L. S., Azevedo, R. K. & Abdallah, V. D. Biodiversity of metazoan parasites in Acestrorhynchus lacustris (L�tken, 1875) (Characiformes: Acestrorhynchidae) from the Batalha River, S�o Paulo State, Brazil. Pan-American Journal of Aquatic Sciences, 11(4): 336-344. Download PDF file (167 Kb). Pinoni, S. A. & L�pez, A. A. M. Digestive flexibility in the euryhaline crab Cyrtograpsus angulatus (Decapoda, Brachyura, Varunidae) from Mar Chiquita coastal lagoon (Buenos Aires, Argentina): responses to salinity of key enzymes in hepatopancreas. Pan-American Journal of Aquatic Sciences, 11(4): 345-355. Download PDF file (232 Kb). Mart�nez, A., M�ndez, S. & Fabre, A. First record of bioluminescence of Alexandrium fraterculus (dinoflagellate), in the Uruguayan coast, South Western Atlantic Ocean. Pan-American Journal of Aquatic Sciences, 11(4): 356-360. Download PDF file (772 Kb). Murase, A., Angulo, A., Sahara, R. & N��ez, O. G. Color variation of a damselfish, Stegastes flavilatus (Perciformes: Pomacentridae), from the Pacific coast of Costa Rica and comparison with a sympatric congener. 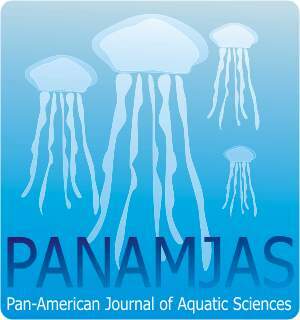 Pan-American Journal of Aquatic Sciences, 11(4): 361-366. Download PDF file (616 Kb).